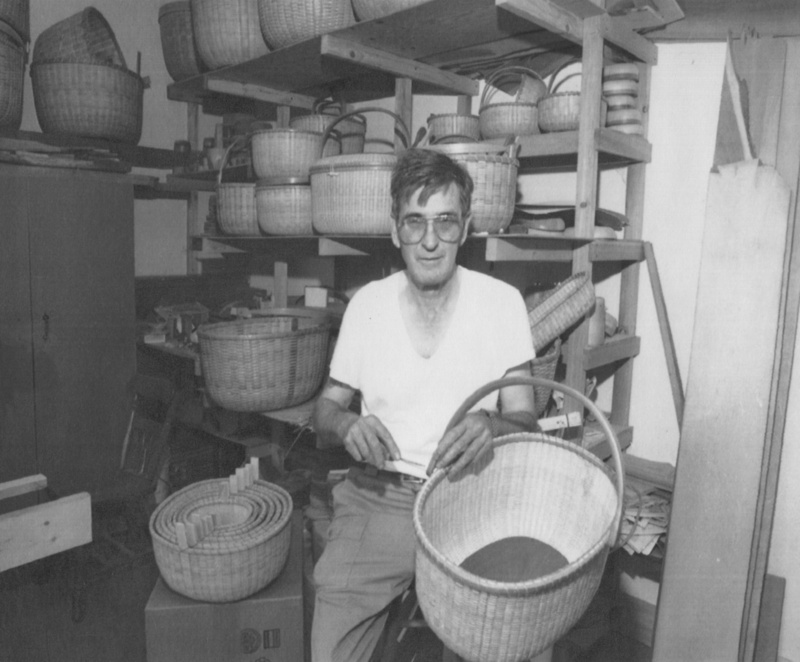 Arthur R. Martin’s impact on basket making in the North Quabbin/Greenfield area of Western Massachusetts was a significant one. “His baskets were all over the area,” one antique buff notes. As a young man, Martin served in the Navy in the wake of World War II. Later, he made a living as a heavy equipment operating engineer, eventually establishing a furniture refinishing business and antique shop. Martin was incarcerated at MCI Norfolk and MCI Warwick for 8 years, and it is there that he developed his skill as a basket maker. A 1987 interview in Antique Review magazine explores Martin’s story further. Arthur Frederickson, a drafting instructor at Norfolk, encouraged Martin to make baskets. Initially, Martin wanted to make baskets in the Shaker style, as he admired their craftsmanship. He worked to make the necessary molds and gather materials. However, ash was in short supply at Norfolk, so his direction changed to Nantucket lightship baskets. His skill flourished upon a transfer to Warwick, which was located in a state forest. Martin was able to gather wood from around the grounds to transform into bases and handles. In the 1980s, Massachusetts had a Prison Craft Industries program where inmates could sell handmade items like furniture, dollhouses, baskets, and other crafts. Martin’s work could be found in antique shops in Western Massachusetts and at the Forager House Antiques and Salt Meadows Antiques on Nantucket. Arthur Martin basket with heart-shaped handles. 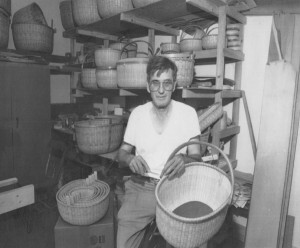 Upon his release, Martin continued to sell lightship baskets in Turners Falls, MA. He worked with Frank S. Hawkins, one of the men Martin had taught to make lightship baskets at Warwick. In a 1991 interview with the Union-News, Martin “said basket making is more than a means to a livelihood, providing a sense of accomplishment as well.” Martin was a prolific basket maker, selling more than 100 baskets at one Nantucket antique shop alone. Martin’s baskets are unique in that they are often oversized. He made many nests of seven baskets. He favored oak construction techniques rather than reed and cane. Martin was a contemporary of Deanne Savoy and Mike Krunklivich, basket makers from Western Massachusetts. 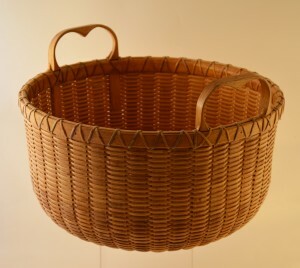 While Martin was largely self-taught, he later influenced many basket makers. Martin was a talented basket maker, teacher and mentor. While made far from Nantucket’s shores, his unique baskets have a defining place in the history of lightship baskets.